So for those that do not know or have not figured out, I’m a big fan of books. No, I’m not a full out bookslut nor would I call myself a bookwhore and I’ve worked extremely hard not to be a book-hoarder. 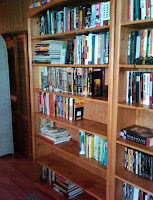 Yes, I have lots of books. 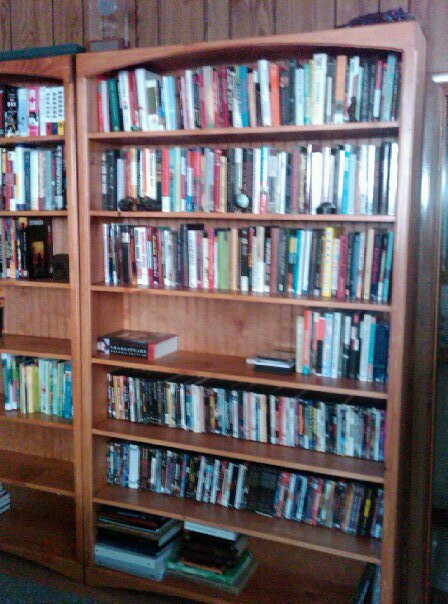 In fact, I recently treated myself to two ginormous bookshelves for them (see below). 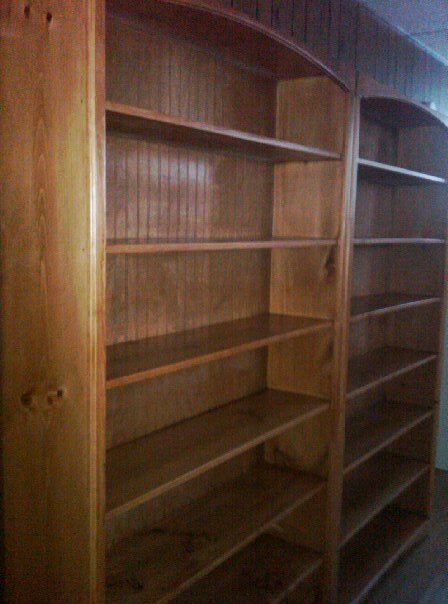 Two 7 feet tall by 4-feet wide bookshelves from The Mill Store. Worth every cent! So in the end, I’m a big fan of books and have accumulated a good amount. Whenever I’m about to criticize someone’s collection of hub-cabs, pez-caps, etc, I look to my shelves and say; am I really any different? Sure, I can make the argument that my books have “knowledge” and “stories” and have taught me a great many things. But often, that is the case with any collector. I could argue that I only keep the “really important ones”; which is amusing since I have hundreds (I’m afraid to actually count and discover that number might even be closer to 1000 than I want to realize). Many of the collectors I know have a story, or something to say about each item they have; just as I can explain or justify my books. Inevitably, for many of us, collecting can have a certain “credit” within our circles and beyond. The comic fan with the entire run of Uncanny X-Men all the way backs to Uncanny X-Men #1 holds also a certain amount of cultural capital within comic-collectors and straight-up comic fan circles. I’ve recently realized (or maybe acknowledge and accepted) that even with my book-reading/collecting, I too buy into the cultural capital of books. My realization has been there in parts, but hit me full blast in the last few months, when I acquired the new bookshelves. I took a “before” and “after” picture of them and uploaded them to my Facebook account. Why? For approval of course; to let friends (particularly the bookish types) drool and appreciate what I had recently acquired and filled to capacity. This got me thinking about what other ways I pimp out my books for cultural capital. Of course, I realized that my Goodreads account (and the fact that I link it to both my Facebook and my blog) was another example. Goodreads.com and other similar sites (like Shelfari) are fantastic social networking sites focused on reading and book culture. You can connect with friends, authors, reading groups, and other fans of your favorite authors/books. Their greatest tool is that they allow you to keep track of books that you’ve read; essentially, a virtual library. This can be great to keep track of all that you’ve read as well as interesting to see what your friends have read and where your tastes overlap. It’s also addicting. Egad! Seeing how many books you have read and then desiring to make that number go up is worse than the friend count on Facebook that people fall prey to. Finish a book, add it to the list and bam! That’s one more accomplishment. I recently surpassed the 2000 mark and yes, I did a little happy dance (in my head). However, besides gaining bragging rights among your more nerdtastic friends, it does serve the purpose of helping you track exactly how much you are reading (and a bigger picture of the type of material you are reading) over a period of time. For instance, at the time of this blog posting, I have read approximately 70 books since January 1, 2011. 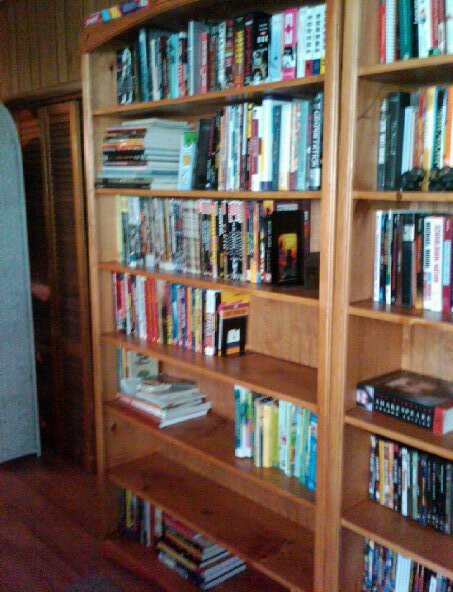 (To clarify, that’s a significant mixture of books, audiobooks, and graphic novels. I am not that quick of a reader!). I find that important; largely because it lets me know how much precedence other fields of entertainment and learning are eating up my time and if I should do something about it. Undoubtedly, a site like GoodReads has made me want to read more because there is something in being to tangibly connect exactly how much I have read over the years. It also proves a great tool at the end of the semester when I can skim through and great a really solid bibliography of recommended readings for my students or anyone for that matter interested in any of the things I teach or talk about. What objects, material goods, information, knowledge, etc do you use for cultural capital? How do you communicate it to those you want to know? Where do books rank personally within your own culture(s)? What weight do you give to books or book readers? Why? How do you establish your own cultural capital among friends, acquaintances, fellow fans, family, or co-workers? Books are important to me; I find them as a good away to get away from the everyday world. Books are most likely one of the heavyset past times I have. When I find an author that I like I find myself going on his or hers web site and talking to other readers about the books and what will happen in the next book, books in a series are my favorites because they do not leave you wanting more. Books for me is heavy in both the physical sense and the metaphorically sense. Books weight heavy on me because I find myself getting lost in the books and sometimes wanting to be there myself, when I find a good book I spend all day if I can reading it, sometimes I even have to finish a book before I do anything else for that day. I have way to many books and find myself spending way too much time looking at new story lines and finding new authors. I also spend too much money on them (it was actually cheaper for me to get a nook then it was to get the next series in paperback or even hard cover). But when it comes down to it I don’t mind spending the money because they are one of the better past times that I could enjoy. In regards to books, and reading them for leisure activity, I can honestly say that I am not a big fan of books. Ever since I was younger and was capable of reading novel-like books, I always found myself watching the movies instead. Sometimes I actually took the time to read the book, and to my surprise I actually enjoyed it. I just always seemed to find the movie as a faster and more convenient alternative. It wasn't until I was in higher classes in High School, as well as college level Literature classes, I found myself reading, and actually feeling some benefits to it. I started off just reading through the books to complete the assignment, but as I began to read more and more, I started to actually find a deeper understanding to the reading I was doing. I began to become more engaged in the reading, and now, although I don't read for leisure activity, I find myself being more of a reader than I was previously throughout my education. I find reading as an extremely valuable source, and I hope to someday sit down with a good book and actually read it instead of going to see the movie, or asking someone what it's about.